We're not exactly sure when tourists started getting such a bad rap. We're referring, specifically, to their sartorial choices. Ain't nothing wrong with high waisted shorts, tourist attraction tees, clunky binoculars and that high SPF glow, right? In fact, the only thing that could possibly up the fashion game of the United States' tourist population are neon, spandex and the overall predilection for tackiness that came along with the 1980s. 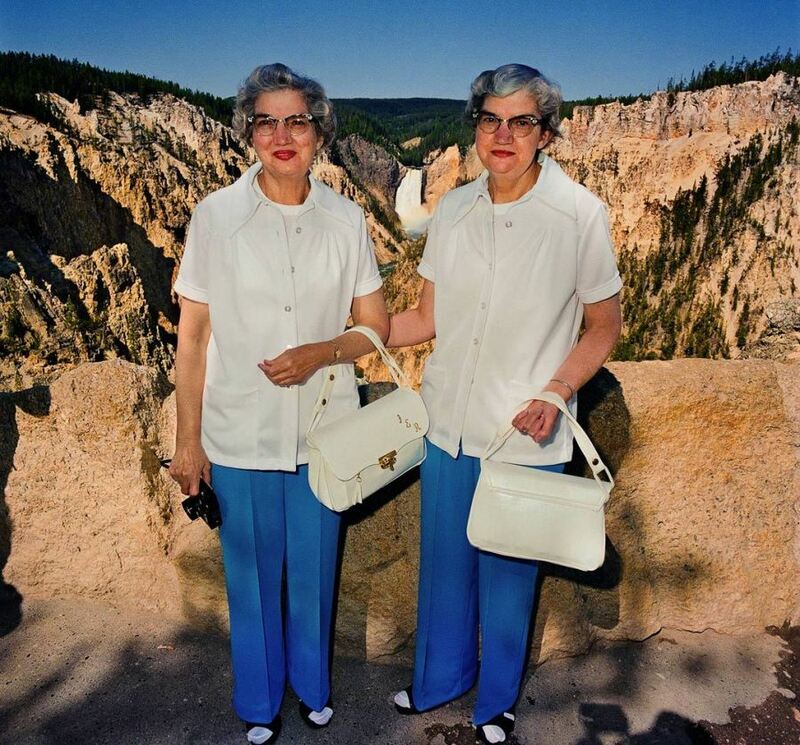 Photographer Roger Minick captured the glorious visual event that occurred when tourists were caught in the wild, compiling his photographic findings into a stunning series called "Sightseers." While Minick's photos are certainly entertaining, they also capture the fundamentally strange habits of tourists, pushing each other out of the way to snap the same photographs of the same places. "I vividly remember how all the photography students would gather at the famous Inspiration Point overlook, get into position with their cameras mounted to tripods, and wait for the grand man himself to move along the line bestowing his blessings on each student’s composition and choice of exposure," Minick explains in his field notes. "It wasn’t long, however, before I became aware of something else going on at the overlook: waves of tourists were continually arriving at the overlook’s parking lot in cars, buses and motorhomes, thrusting their way through this gauntlet of photographers not only for a clear view of the famous vista but also for the obligatory snapshot of themselves proving they were there." The tourist phenomenon of the '80s has almost engulfed our entire contemporary existence thanks to Instagram and other such contemporary additions. Now the need to prove we exist, and capture it in film, dominates many a morning brunch and trip to the museum. It's interesting to see the roots of our obsession with visual documentation at these American landmarks. You may, like us, have an aesthetic soft spot for the beauty of suburban life. If so, you'll rank the following photographs with the highest tiers of photographic artwork. Seeing country's greatest natural wonders, from the Grand Canyon to Bryce Canyon, juxtaposed with the kitsch overload that was '80s fashion, is truly a sight to behold. At the very least, it's a retro throwback that will force a few smiles. See what happens when the camera is turned on the tourists for once in the photos below. Be warned, you're about to experience some serious fanny pack envy.